Meme etat d esprit que celui de miami avec le bord de mer en plus !! Genial personne attentionnée gentil et serviable !! Amazing! 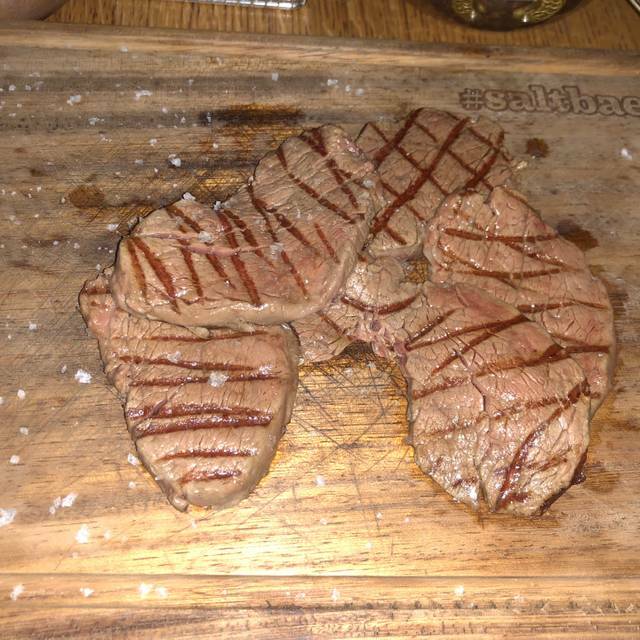 Great meat, fantastic ambiance!! Absolutely amazing! Delicious food & SaltBae came by! I am thrilled to have the chance to dine here because I am one of Nusret millions followers. 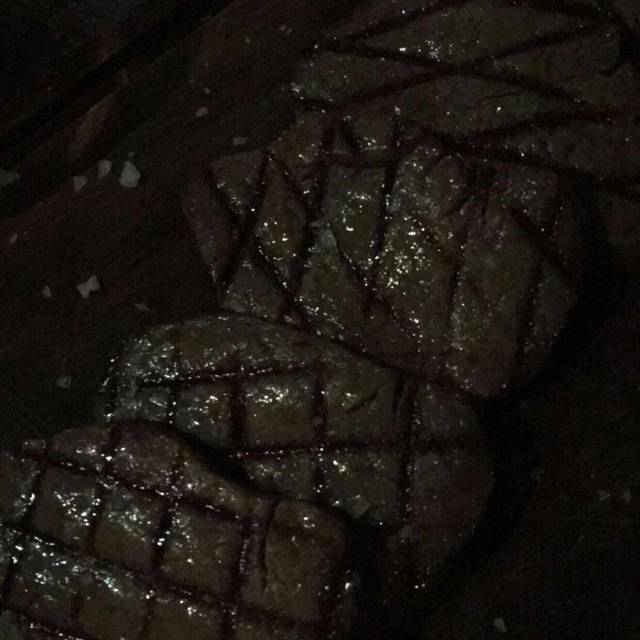 Except i am expecting more on the taste which I think nothing really outstanding compared to other medium range price steakhouses. Really good! Had a table outside, lovely surroundings. Staff were great! Food was great, can’t complain! It can be a costly meal though. Amazing service! Amazing food! Amazing atmosphere! Me and my family were the second time at this nusret restaurant in Abu Dhabi. The first time was good. But that time the service was really bad. We made a reservation and came punctual to the restaurant and got a table at the terrace door. Second the menu card is absolutely not vivid. We asked the waiter to show us a few stakes that are placed on the meat menu instead he brought us to the meat counter and talked in Turkish.. even his English wasn’t understandable. With no clear explanation we went back to the table and ordered some meals. The table was too small for four persons. 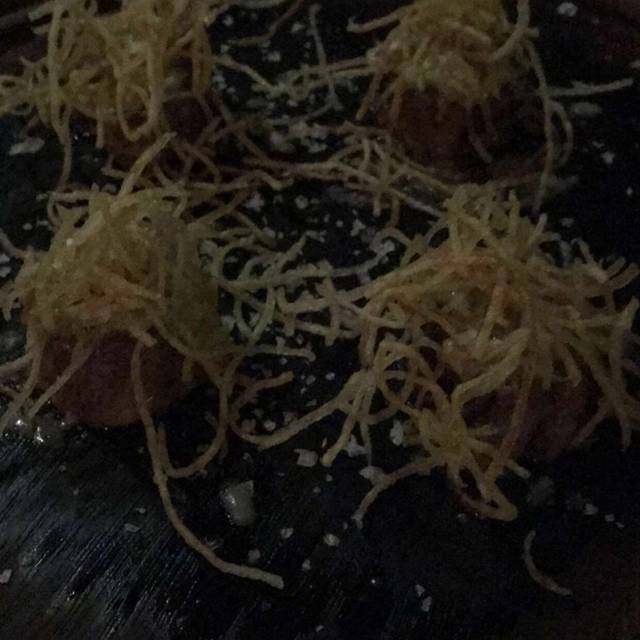 We ordered ,inter alia, cheese meatballs and expected a show with flame but the waiter at the end told us because of some issues it wasn’t possible. The crew was so overstrained and not organised at all.. we always had to call a waiter there was no waiter who really looked after our table. We ordered the meat well done but it was bloody and we told this but the waiter didn’t replace the meat. He took it to the cook and roast it again. I expected this evening to be very good but instead we left very disappointed. Compared to other restaurants with meat and steak houses this one is really overpriced. Too much hype over poor menu options. Unreasonably expensive. I was hoping for an experience at reasonable price but was disappointed with the food and really pricing the travellers who make their way from other countries for just a nice bit of nusr-et. If you like hype and enjoy paying high prices go for it! Otherwise stay with other steak houses who offer good quality food at reasonable price. Wir waren im Urlaub in Abu Dhabi und haben uns entschieden das Nusr-Et zu besuchen. Wir waren im Juli schon in New York in seinem Restaurant und haben ihn auch persönlich angetroffen. In Abu Dhabi war der Preis ein wenig günstiger (€). Das Ambiente ist wunderschön Und man hat einen sehr guten Blick auf die Skyline von Abu Dhabi. Die Kellner waren alle sehr freundlich und zuvorkommend, wie es für diese Preisklasse aber auch nicht anders zu erwarten ist. Das Essen kam nach 15 Minuten. Das Saslik war geschmacklich sehr gut und die Fleischqualität überragend. Am besten jedoch war die „burrata“. Eine große Mozzarella-Kugel, welche die Konsistenz von Frischkäse hatte und einfach nur top schmeckte. Wenn wir das nächste mal in Abu Dhabi sind werden wir definitiv wieder dort essen gehen. Ich kann es jedem nur empfehlen. Im Vergleich zu seinem Restaurant in New York alles in allem fast gleichauf, jedoch in den Emiraten günstiger und gemütlicher. 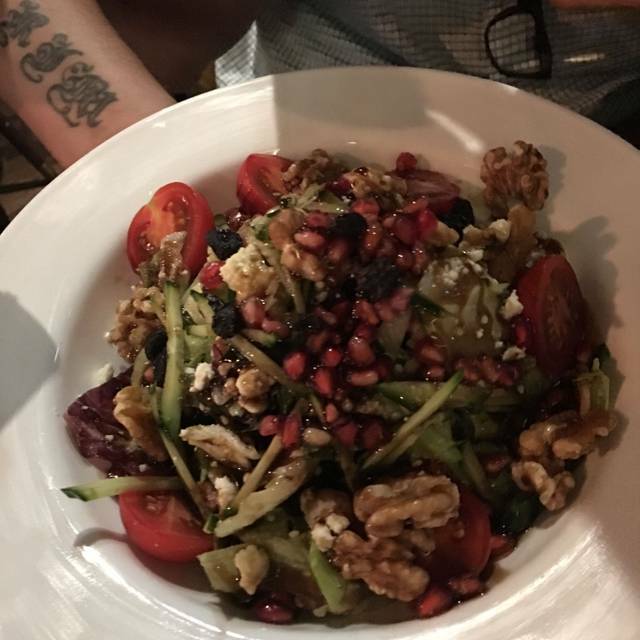 The food was amazing, the location fantastic and the service was so fast, you couldn’t raise your hand and someone was already at the table! Always a great experience at Nusr-et, albeit overpriced vs restaurants of similar food quality. Very disappointed this time. The food was average and the service was “too much”. To many people came to the table all the time and ask how it was. Took away our plate nearly before we were done. Stressful even if it wasn’t crowded at all. Will probably not come back since the prices are very expensive as well. Beste Steakhouse in Town ! Solche Rohware findet man selten auf der Welt, vielleicht noch South Africa! Everyone working there are sweet and nice people full of joy ! Professional and enjoyable ! We enjoyed our meal and super show of its preparation! Must visit, see and taste!!! brilliant - all of it. Famous for Saltbae I just want to tell you about winebae. A Turkish sommelier with extensive wine knowledge from ancient to new world who was just as interested in my own experience of wine from around the world. Fantastic food experience in excellent surroundings, just don’t forget the sommelier! 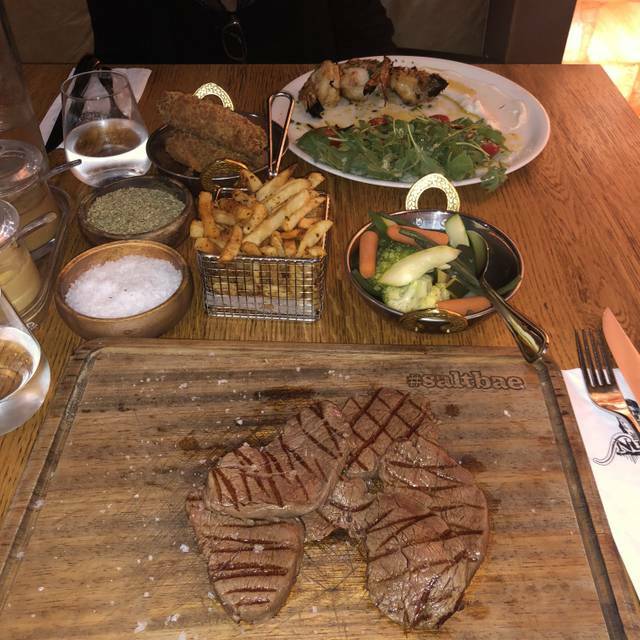 It was our first Nusr-Et experience on our Honeymoon in Abu Dhabi and it was amazing. The Service, the food, the Baklava Presentation Show and Turkish Tea was excellent. Thank you Nusr-Et for this quality, you are the best we have ever seen. Bummer, that we cant see you live.. The service in this place is intended to be fast for a quick turnaround table. This is never good in a restaurant. The meat was not cooked as requested and had to be taken back, the mushrooms were cold and had to be made hot. The waiters are no where near professional and tend to compensate that with loud laughs and surround the table in a weird way. Roberto's has short ribs just as good with 50% less bill. The food was really good: we tried the fillet mignon and the lukum, the kofte with cheese and the nusret salad. The salad was fine, the koftes were great and the fillets delicious, though the lukum was a bit greasy for our taste. The wine list had enough choices, but all wines were insanely expensive! The prices of the food were very high too, in relevance to the what they offer. Oh! And the baklava at the end was very tasteful too! Staff - Unbelievable, we live in the UAE where service is pretty good, however the service here is another level. Something we've never experience, every member of staff was friendly, smiling, welcoming, chatty, and made us feel special and welcomed. Food - Unbelievable, it seems expensive compared to other restaurants, however you'll quickly realise why, everything from the cooking of the food in front of you (meals we had was cooked in front of us at the table), to the service of the staff, to the quality of the food had the wow effect. We've dined all over the world and in many restaurants however this one was the best so far. Drinks - They had a nice wine menu and the sommelier also helped with our decisions based on the food we was ordered, everything was paired nicely. Atmosphere - Nice background music, very eclectic. Staff was always happy and smiling, and made an effort to please people on their birthday. Can't wait to come back, and we seriously have no idea how anyone can give it a negative review. Looking forwards to trying the Dubai outlet. Really enjoyed the food, ambience and service. Beef carpaccio was excellent (best to share with perhaps one other started between 2). Make sure to save room for the baklava. Always great time at Nusr Et! I was looking forward to this meal. Read the reviews and people advising was pricey put me off a little. On arrival table wasn’t ready even though we was 5 minutes late. Busy and the waiters were rushing around. We waited 5 minutes and got a seat which was fine. Menus presented to us by our waiter and I expected to receive an explanation on how/what to order with his recommendations. We didn’t get any of this but I did ask what was the difference between Lokum and Fillet Mignon which he explained. The waiter did seem a little grumpy compared other waiter experience we have received. We ordered a large bottle of water, 1 Corona, Calamari starter to share, Lokum steak with fries and steamed vegetables and my wife’s a pescatarian so she got the prawns and croquettes. Starter was good. My steak came and was a little cold I got it medium rare. (The air con was on full blast it felt like). My wife’s prawns looked very nice and tasted good. Really big and juicy. Croquettes nice but overpriced. Celebrating our anniversary the manager came over and congratulated us which was a nice touch. We was in and out within an 1hr and it felt more like fast food service to turn the tables around. I did like performances which was saw other people get which I presume is dependant on what you order. Overall it is pricey for what you get and food is good but not great. We live in London I still prefer Gaucho or Hawksmoor and would have been slightly cheaper for what we ordered in London’s finer restaurants. Can't wait till they come to london - watch out goodman/hawksmooor!